I occasionally hear complaints that kendo’s character has been diluted where it is practised outside Japan. Now obviously I can’t speak for the rest of the world, but by and large the export version seems remarkably similar to the Japanese domestic product. When I did Judo many years ago, in the days before koka and yuko were introduced. Even then I felt that it had moved on from the original concept. Japanese terminology and its English equivalent were interchangeable and ogoshi and ippon seoinage often became “hip throw” and “one point shoulder throw”. Although training was conducted in a disciplined and respectful fashion, bows had become quick nods before pulling open the judogi to make it harder to hold. 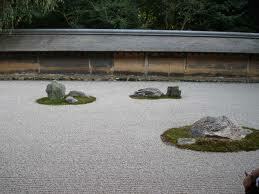 So to me at the time, the “Japaneseness” of kendo was part of its attraction. I found then, as I do now, that by comparison most overseas kenshi do a pretty good job of using Japanese technique names and although I have heard the occasional reference to “kiri crash” and “jogai buri”, these have typically come from new converts who have yet to learn the correct words. Reigi too is followed more or less as it is in Japan, although we may not be totally sure about the correct direction of kamiza. Techniques seem consistent wherever you go, with allowances for peoples respective level of experience or technical ability. 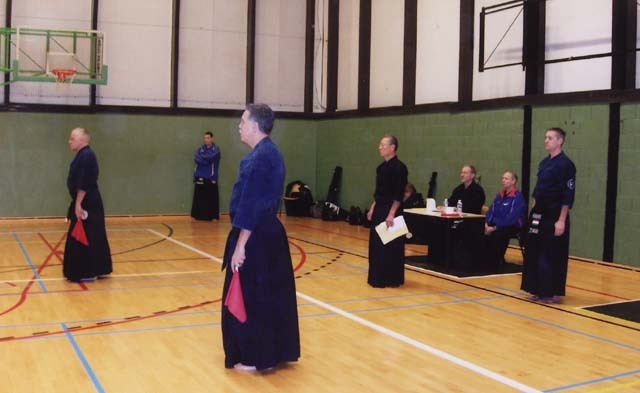 If someone who had never seen kendo before, witnessed keiko sessions in Chicago, London, Paris, Sao Paulo and Singapore on different days of the week, he would have no problem in telling you that he saw the same thing in each place. Kendo seems to have a different ethos to some martial arts that have obvious self-defence value. Several times when I’ve spoken to other martial artists and mentioned my length of time in kendo, they have asked me incredulously why I have not set up my own school or system. The honest answer is that I have never even thought about doing so. If I had, then I would still take the view that it is better to be part of a global group of like-minded friends with the same objectives and ambitions, than to go-it-alone for the sake of selling lessons to beginners. Is it the mental, character building element of kendo, or the fact that, thanks to the efforts of FIK, most countries around the world get regular exposure to senior Japanese teachers that helps keep kendo in such an undiluted form? There is also the fact that kendo is addictive to the extent that many foreign practitioners find their way to Japan to deepen their exposure and spend varying amounts of time, whole lives in some cases, studying kendo at the source and evangelising on its values and etiquette to the rest of the World. I apologise to practitioners of Korean kumdo if my blog continually focuses on Japan. It is simply that my experience has come from the Japanese kendo tradition and I have little knowledge of the Korean equivalent. Having said that, I strongly suspect that there are numerous shared values between the two. I have also seen kendo in organisations that fall outside the aegis of FIK and felt that there were more similarities than differences. There has long been talk about making changes to the kendo scoring system to make it more understandable and interesting to spectators, but I personally hope that this does not happen. Whilst kendo becoming more popular would benefit the sport financially, I believe that we would become emotionally poorer by losing kendo’s aspect of shugyo. I for one would not want to start each keiko by touching gloves before going for a “head strike”. I returned last night from Brussels where I attended the annual European Zone Referees’ Seminar. These events take place in the three FIK zones, Europe, Americas and Asia and serve the purpose of both updating referee skills and as a selection forum for referees for upcoming regional championships and in some years World Championships. For those of you who have not attended one of these functions, the format tends to be fairly consistent every year and in all three zones. The ZNKR send a delegation of three 8th dans as instructors to share their knowledge and each member country sends a group of referee candidates to benefit from their instruction. The referees work together in two groups; red numbers – who are candidates for the next regional championships and black numbers – people who are either newer referees or who are not available for selection but who want to keep their skills up to scratch. Each country also sends groups of fighters to take part in the shiai. The event takes place over a weekend and includes keiko sessions on Friday and Saturday nights and at the end of Sunday morning. The grand finale is a grading examination up to 7th dan, which in Europe is one of the few opportunities to try for this grade. The weekend is a great chance to meet up with old kendo friends and to make new ones. The actual seminar takes the form of referees working together in groups of three and the 8th dan instructors stop the shiai to point out mistakes and invite discussion from the rest of the group. Candidates are numbered according to age and seniority and each session starts with the lowest numbers first on court. For some reason, probably due to the retirement of some of my senior colleagues, I was number two red. I therefore had the pleasure of being in the first group to referee; the one that invariably gets stopped most often to set the tone for the weekend. In some years there seems to be an emphasis on a particular aspect of the shiai rules. This year it was not so. The sessions served more to emphasise correct positioning of each group and the criteria for judging valid yuko datotsu. The groups of fighters did a great job, treating each shiai as if it were the final of the World Championship. This year I was particularly pleased to see that the British national coach, Malcolm Goodwin, had arrived with a team of our younger competitors who fought well and gained a number of compliments on their attitude and team spirit from the EKF organisers. My last job before leaving was to sit on the grading panel for the first to fifth dan group. This was of course an honour and a pleasure to do, but sadly it meant that I was not able to watch the 6th and 7th dan grading which took place simultaneously in the next court. 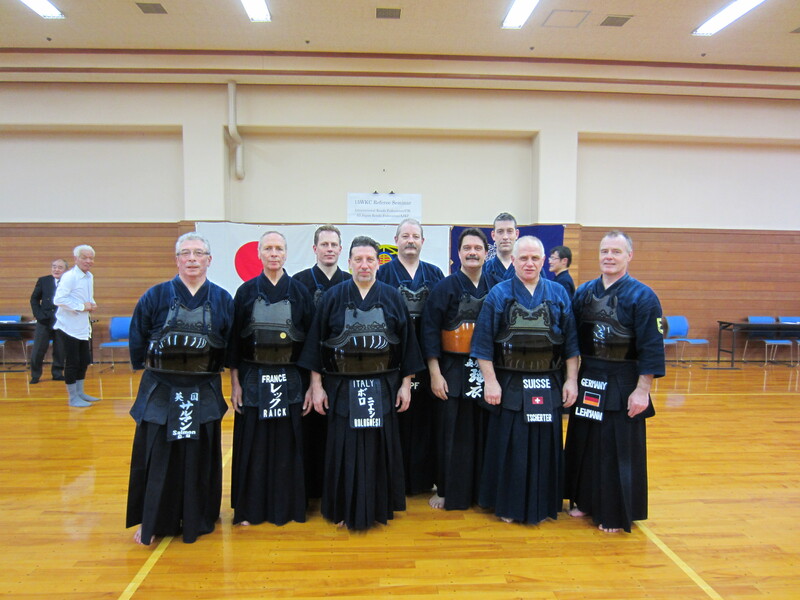 Two candidates out of 14 passed 7th dan including Mr Kurogi from Belgium. Our team manager Malcolm Goodwin was one of the few to pass 6th dan and in my court two British guys Alan Thompson and Keith Holmes passed 5th dan. Congratulations to all the successful candidates, name checked or otherwise. I am now going to unload a case of duty-free wine and two sets of wet kendo equipment from the car. As most kendoka are aware, the 15th World Kendo Championships will be held in Italy in three months time. I imagine that the organising committee in Italy is working flat out to ensure that such a major event runs smoothly. The FIK team in Tokyo are working equally hard to supply the support and technical resources to guarantee success. Part of their role is the selection and training of the referee team for Novara. Having just returned from Narita where the first of two referee training seminars for this event was held, I am using this opportunity to give my readers an insight into what goes on “behind the scenes”. The 15WKC will have 36 referees. If you include the shinpan cho and the four shinpan shunin, this takes the referee team to 41 people. We were gathered together in Narita together with 20 of Kanto’s top university players, to work on our refereeing skills. The whole event took place under the watchful eye of senior members of FIK and Tatsuo Hayashi and Alex Bennett were on hand to provide translation for the non-Japanese speakers. It all ran like clockwork, with hotels, busses and gym schedules fitting together without a hitch. The format of the training was to apportion referees to two courts and to change our groups over two days to give us experience of working with different partners. These were drawn from Japan, Korea, USA, Canada, Brazil, Taipei and eight European countries. There was very little lecturing. The shiai continued relentlessly with discussion over any split point decisions, or less than optimum referee positioning introduced by the shinpan-shunin. Most of the fighters took chudan with one jodan player present and a nito session was introduced, with Toda sensei and another nito player showing their skills against some of the students. Normally at events of this kind, criticism is heaviest at the beginning and diminishes as we adjust to working together. I had the pleasure of being the first shushin in my court after the opening ceremony and received a well deserved mauling for some court positioning issues. Being dissected in front of 40 seventh and eight dans focuses the mind brilliantly and our performance steadily improved, so that the afternoon and following days sessions generated hardly any discussion. Very few new technical issues were evident. Tsuki was seen frequently but did not make ippon, (usually because of accuracy), and dou was seen frequently and in most cases succeeded. The only controversial question was on the point to which fighters should withdraw at the instruction “wakare”. Apparently International rules say “past the Nakayui” and All Japan rules say “to the kisaki”. This was followed by sayonara party to let off steam and cement friendships and the instruction to reconvene for another two days of training in Novara.